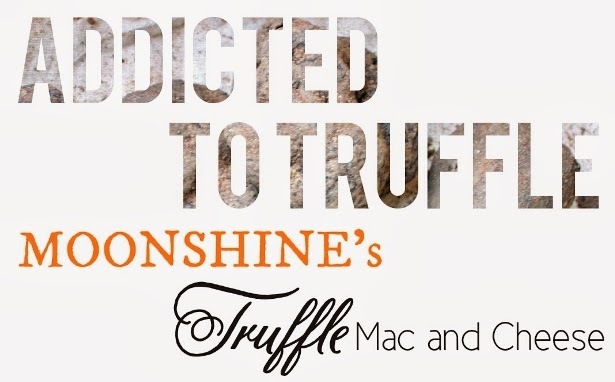 Welcome to the first-ever Addicted to Truffle post! 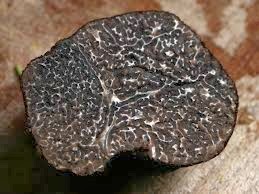 In this new series, I will be featuring individual dishes utilizing one of the best creations on earth: truffle. Or truffle oil, to be exact. I’m not sure if many would agree with me that it’s one of the best ingredients of pasta dishes—it’s an acquired taste. My first encounter with it didn’t exactly start fireworks in my taste buds as well. But after eating too much Italian (food, not people) … let’s just say, I learned to love it. In fact, I learned to adore it so much that every time I’m in an Italian restaurant, the word “truffle” is the first word I look for in the menu. What is truffle anyway? To those who are not familiar, truffle is a type of edible fungi—think of the mushroom—that grows near the roots of trees. Truffle oil is a byproduct often used in pasta dishes, and I’ve learned that most oils sold around do not contain real truffles at all! 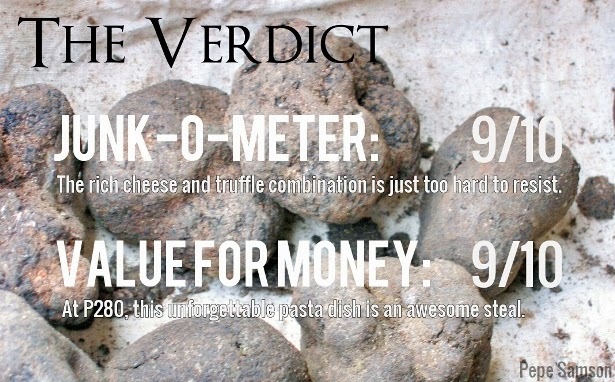 Owing to the fact that truffles are very expensive, the synthetic versions use olive oil as well as components and substitute shits similar to the odorant of real truffle. So there! I’m addicted to something artificial, LOL! But who cares anyway? If you want to spend $90 an ounce for genuine truffle oil, fine—but I’d rather proceed to the featured dish and get this post done, haha! So for today, I have chosen Moonshine Bar’s creation as the Truffle King. 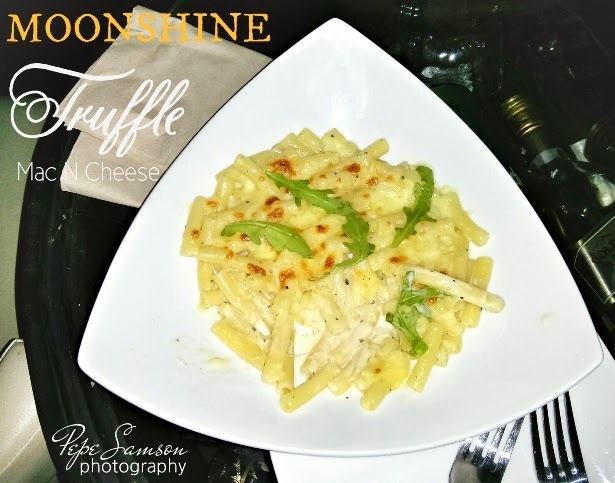 Ladies and gentlemen: Moonshine’s Truffle Mac and Cheese! Look! I swiped at my food before taking a pic! MORTAL SIN! This dish is so damn good, I ordered two plates, one after the other. No, that’s not gluttony—that’s proof of its awesomeness. Indulge in the richness of cheddar, mozzarella, and Emmental cheeses, heightened by the earthiness of truffle oil on macaroni pasta. Heaven. What truffle dishes from other restaurants I should try? Any creation you want to get featured? Share your thoughts in the comments section! You can post using your Facebook account!